Is your goal to pursue a healthier lifestyle in 2011? It’s a challenge, since the diet for many of us is too high in saturated fats. (America’s two favorite foods, burgers/cheeseburgers and pizza, are full of them). The processed foods most of us eat too much of are full of salt and sugar. And our diets are too low in key nutrients such as omega-3 fatty acids and vitamin D.
When searching for easy solutions, one need look no further than the sea. Fish and seafood are natural sources of the nutrients we need the most. They’re in a food group that both adults and children should eat more of. Most likely, you know this. But since it’s Healthy Food Month at THE NIBBLE, we want to remind you that groups such as the Food and Agriculture Organization of the United Nations and World Health Organization recommend the benefits of eating fish for heart health in adults and brain development in babies. by Katharine Pollak | THE NIBBLE. ”For the general population there are no types of commercial or store-bought seafood to limit or avoid,” says McGuire. According to the FDA, the dietary goal is to eat a variety of seafood 2-3 times a week, but few Americans meet this goal. On average, Americans eat fewer than three ounces of seafood a week, compared to the recommended 8-12 ounces. NEW YEAR’S GOAL: Triple or quadruple the amount of fish you eat to meet the recommendation. Add shrimp and scallops to pasta, omelets and salads; eat more sushi and sashimi; grill fish twice a week. According to McGuire, fish oil supplements are not an equal substitute to eating fish as a whole food. “A variety of seafood will give your body omega-3s, lean protein, vitamins including B and D, iron, calcium, and more,” says McGuire, “whereas a fish-oil pill stops at omega-3s.” Supplements are not a complete trade-off. Oily fish like tuna, salmon, mackerel and sardines are some of the top omega-3 sources. NEW YEAR’S GOAL: Serve tuna and salmon at least once a week. 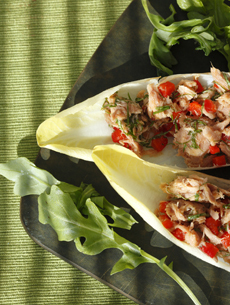 It’s easy to pan-fry, poach or grill salmon and toss canned tuna into hundreds of recipes. If you think you don’t like mackerel and sardines: Look for fresh sardines—delicious grilled—and try mackerel at sushi bars. Raw mackerel is mild and not “fishy” like the cooked version. The 2004 FDA recommendation for pregnant women and nursing mothers states, “Fish and shellfish contain high-quality protein and other essential nutrients, are low in saturated fat, and contain omega-3 fatty acids. A well balanced diet that includes a variety of fish can contribute to heart health and children’s proper growth and development. So, women and young children in particular should include fish or shellfish in their diets due to the many nutritional benefits.…” There are just four fish varieties that this target audience should avoid as they aim for 2-3 seafood meals a week: shark, swordfish, king mackerel and tilefish, all of which have mercury levels. Fish in all forms, as long as it is prepared in a healthy way, counts toward the 2-3 servings per week goal. “I eat a lot of canned and pouch tuna, salmon, and sardines along with frozen and fresh fish,” says McGuire. New year, new opportunity to eat better: There is no better time to include seafood in your diet than now. Find our favorite fish recipes in our Seafood Section.